What Can I Find on AppExchange? Describe how Salesforce organizes AppExchange listings. Your first week at Ursa Major Solar had been perfect. Friendly coworkers, great office, and a challenging project to tackle for your first Salesforce admin gig: the rollout of Sales Cloud at the region’s leading renewable energy company. Managers were enthusiastic, and the sales team was excited. Things looked bright and sunny, as Ursa Major’s president was fond of saying. Eight weeks in, and most of Ursa Major’s sales reps have made the jump to the cloud. Just as you expected, they’re logging more leads and closing more deals than ever. Yay! But a few people are still selling the old way—tracking activities with scraps of paper, sticky notes, or sometimes not at all. You’re confident that you can get the team to 100% adoption, but to do that you need data. For starters, you want to know how often reps are logging in and which features they’re using. A way to visualize that data sounds nice, too. Problem is, you’re busy with other projects. So are you facing an impossible task? Not if you become an AppExchange Superhero. AppExchange is the Salesforce store. It’s your marketplace for all things Salesforce, including apps, Lightning components, and more. What does this mean to you? Think of AppExchange as a gadget in your problem-solving utility belt, like Lightning Process Builder. Short on time and don’t want to build a solution from scratch? There’s probably an app that meets your needs. That third-party service your users have been asking you to integrate? Good chance that it’s available on AppExchange. And because it’s the official Salesforce store, everything you expect from us, like security and trust, carries over to our listings. Peek behind those listings and discover that AppExchange is also a community. That community starts with Salesforce partners. They’re the awesome folks creating solutions and services on top of Salesforce. And then there are people like you—the admins, developers, and others who use AppExchange to make your processes more efficient and teams more productive. Together, this community has powered AppExchange to more than 4,000 listings, 70,000 peer reviews, and 5 million installations. AppExchange has something for every Salesforce cloud and product, but in general, you can see two kinds of listings: solutions and consulting services. A solution is something that plugs into Salesforce and extends its core functionality. For example, an app that integrates an external survey tool with Service Cloud. Other examples of solutions are Lightning components, Bolt templates, and Lightning Data. A consulting service is a group of Salesforce professionals who specialize in building custom solutions for specific clouds or industries. For example, a consulting service can work with an equipment manufacturer to develop a set of apps for assembly technicians. Of course, not everyone comes to AppExchange knowing what they want. Perhaps you’re curious about what’s available for Sales Cloud, or if there’s an especially popular app for your retail company. When you’re not sure where to start, check out the store’s collections. Collections are groups of listings curated by AppExchange experts, and they’re a handy way of zeroing in on the top solutions in a particular area. We talk more about collections in the next unit. 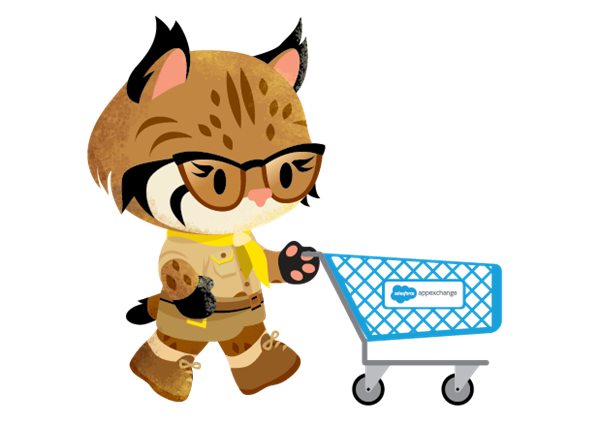 One more thing: Like the product selection at your favorite online store, what’s available on AppExchange is always changing and growing. Stop by often to see what’s new, or sign up for the AppExchange newsletter to get updates sent to your in-box. Next to Industry Collections, perhaps you’ve noticed the Ohana section (1). Remember the AppExchange community we talked about earlier? They’re an extension of the Salesforce Ohana, or family, and they’re so important to the success of AppExchange, we gave them their own corner of the store. Head over to the Ohana section to connect with fellow community members and get the latest news, tips, and content from the AppExchange team. You’re probably wondering whether AppExchange fits into your budget. With thousands of solutions that are free to install and use, the answer is yes. 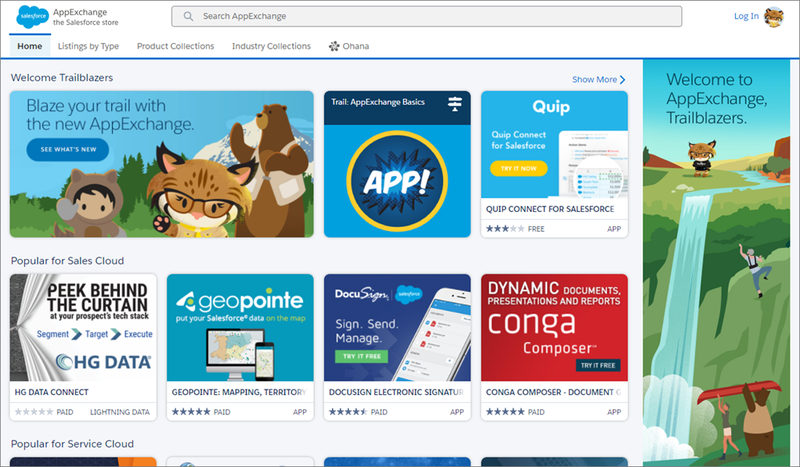 In fact, some of AppExchange’s most popular offerings are free, like our Salesforce Labs solutions, which are built in-house by Salesforce employees. Many providers also let you try before you buy so that you can be sure that whatever you’re interested in purchasing meets your needs. In the next unit, you learn how to factor pricing into an AppExchange strategy. Now that you’ve mastered the fundamentals of AppExchange, let’s return to the challenge facing Ursa Major Solar. To get the sales team to 100% adoption, you need to figure out how they’re using Sales Cloud. Specifically, you want to know who’s logging in, how often, and what features they’re using. But how? After some brainstorming, you come up with the following options. Compile the data manually—Ha! You’re a Salesforce admin. You’d don’t do “manual” anything. Next option, please. Build something yourself in Salesforce—Certainly a possibility, but you’re buried under a bunch of projects at the moment. You can keep this as a backup option. Look for a solution on AppExchange—Maybe a tool that meets your needs already exists, and all you need to do is find it. It’s worth a try, right? So AppExchange it is. At this point, you might want to head straight to AppExchange. But with thousands of listings, browsing without a plan isn’t the most efficient way to find a solution. The better route: Learn how AppExchange Superheroes hone in on the perfect listing. When you’re ready, head to the next unit for the training montage.